My dear little ones, The sun is pointing the tip of its nose, the birds have started singing and while I am writing these few lines the spring has begun. 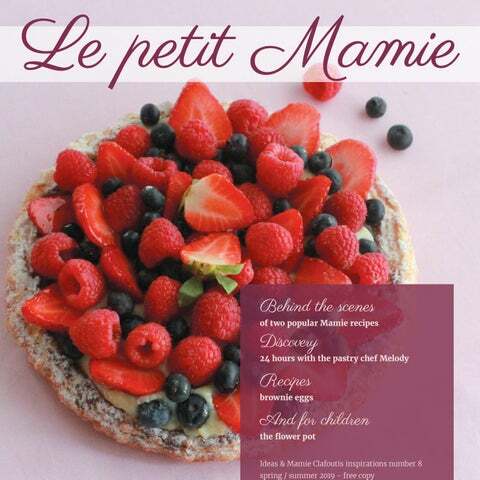 It is with great joy that we meet again for a new edition of the Petit Mamie. A special edition in which I invite you to enter in my daily routine and my shops. You will discover the day to day tasks of a pastry baker and the secrets of making two of my favorite products. Above all, I invite you to join me in thinking about the different ways and habits we can improve to save our planet! Accompanied with the warm sun, is the tasty fresh seasonal fruits. I have plenty of tips and stories to give you, so you can fully enjoy them! I hope that you relish the freshness of this issue as much as I did in writing it! This exhibition brings together in a spectacular scenography the original creations of the French designer Thierry Mugler. Imagine technological solutions made with recycled material! An activity that will appeal all ages. Located on the edge of the St. Lawrence Rapids, this park offers outdoor activities for the whole family. Including a public beach available starting from the beginning of June. For this special occasion, Mamie invites you to discover her delicacies that will delight all mothers. Celebrate the return of spring and admire the tulips throughout the city of Ottawa. Millions of tulips, including shows and activities for all! For all two-wheel lovers, this festival is a great opportunity to ride with family and friends without stress or chrono! Several activities are proposed. Ottawa-Amazing performances by street artists from around the world: come and admire clowns, jugglers, acrobats, magicians and more. Enjoy the Lachine open air museum-on foot or by bike, discover this park which today ranks among Canada's largest sculptured gardens. Very few people know what the job of a pastry baker really implies: different work schedules, sustained physical activity, meticulous tasks... To help you discover behind the scenes, Mamie invites you to spend 24 hours with Melody, a passionate and energetic pastry chef! 6:30 am-8:30 am I check my inventory for the day. I coat the pies, ice the Mamie Choc, I take out the other pastries of the moment and make a nice set up in the window display. Except on Wednesdays, where I take care of making crêpes for the day. 6:00 am I arrive at the shop and I check with the night shift pastry baker(who took care of baking the products) making sure the night went well and that the quality of the products meet Mamie’s expectations. ith MĂŠlodie 9: 30 am-10 am "The job of a pastry baker is exciting because every day is different." 9:00 am When the shop manager arrives, we have a short meeting and I provide her with a recap of the day. On Tuesday we take more time to discuss the new products that are coming, as well as the recipe ideas we would like to develop in the future. Then it's time to tackle the pastries for the next day. I place them on a cookie sheet in order to let them rise and the yeast do its job. This is an important step in the preparation, it allows the pastries to have a nice shape. 10:00 am-12:00 pm Then comes what I consider to be the bulk of my day: tackling the production of the recipes and batters. For example, I can make almond croissants, Mamie Kouigns, Mamie pies, (which is my favorite task, in general I make between 12 to 24 a day), batters of all kinds (for clafoutis, crêpes, pastries...), I prepare lemon pies, meringues, chouquettes, etc. It's a big job with lots to do! 12:00 pm-1:30 pm The night shift baker finishes, I take over the oven for the last orders of the day. If I still have some time, I work on new recipe ideas and have my fellow colleagues taste and provide me with feedback. 1:30pm-14:30pm I clean the lab and make sure it’s ready for the next day. Once finished, I leave to pick up my kids at school! The Melody FAQ What are the qualities of a good pastry chef? For me, a good baker must be passionate about his/her work! He/she must also be a bit eccentric, because the working schedules makes us offbeat, our schedules arenâ&#x20AC;&#x2122;t synchronized with the rest of the world. A good pastry baker must also be very organized and reliable. Have you always wanted to be a pastry chef? Since I was very small, I always wanted to create candy, then very quickly before adolescence I decided to be a pastry chef. I always loved making cakes and biscuits, my parents let me experiment in the kitchen and always encouraged me. I went to the ITHQ as soon as I finished high school! What are the pros and cons of a pastry baker's life? In my opinion, the job of a baker is exciting because every day is different, there are always new things to learn and to try or challenges to face. It is a very physical job and you have to be in good shape, but I prefer it a thousand times more than a sitting job. I like it when things move fast, the day goes by fast as well. The biggest drawback is not being on the same schedule as the rest of the world, especially now that I have children, I have to work weekends or during the Christmas holidays. Also, I have to get up really early. Thanks to Melodyâ&#x20AC;&#x2122;s beautiful testimony and righteous words, you now know more about the day to day job of the pastry chef profession. Join us in our next edition and learn more about the bread baker profession. But why turn to organic farming? Because its objective is to preserve the soil, the natural resources, the environment and the work of the farmers. It is based, in particular, on the nonuse of synthetic chemicals, the nonuse of GMOs, the recycling of organic matter, the rotation of crops. This is the best solution for the environment and its consumers. Today, the percentage of Canadians who buy organic products each week is 56%, a figure that increases every year. Mamie Clafoutis is very proud to be working with the Milanaise Mill, a Quebec company that LOCAL supplies locally, one of Mamieâ&#x20AC;&#x2122;s values is to prioritize local commitment. In order to reduce its environmental impact, Mamie buys its products according to the season: for example, the beginning of the production of fruit pies during the summer will depend on the arrival of fruits produced in Quebec. Mamie Clafoutis is proud to use La Milanaise Mill organic flour. Find the small green stickers on the labels in the boutiques to know which breads are made with the organic flours from La Milanaise Mill! "We have to work together because we are nothing without common actions." The use of the packaging is very brief because the products are fresh and are quickly consumed. This is also why several of Mamie's products are sold in refundable glass containers, which are manufactured in Montreal. coffee if you come with your thermal mug and we will fill it up for free! Stay tuned on Mamieâ&#x20AC;&#x2122;s Facebook and shops for further details of this upcoming offer, available in all of the Mamie boutiques. If we want this to work and make a bigger impact, we need to work together. Mamie knows that there is a long road up ahead but strongly believes in helping the planet and knows that clients are also sensitive to this matter that affects us all. Canada holds the unenviable title of champion for waste production per resident in OECD DIRECT countries: every QueACTIONS becer produces an average of 700 kg of non-recycled waste per year, we all have to work together to bring this figure down. 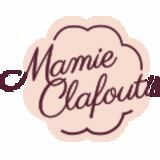 To reduce its waste consumption, Mamie Clafoutis has removed the plastic straws from its shops. But Mamie needs your help to make these actions have a greater impact: for example, when you buy a pastry, do not hesitate to suggest to the employees to reduce the packaging for you. Mamie Clafoutis Fleury is developing a pilot project with the Montreal company La Tasse to offer reusable take-out cups! This magazine is recyclable because Nap-Art is committed to making optimal use of resources by choosing FSC paper, and vegetable inks for the manufacture of its products. MAMIE KOUIGN THE PRODUCT BASE THE CROISSANT To prepare a good croissant, you have to count several steps and a lot of patience, because it takes time. Once the baker has kneaded the croissant dough with a bread mixer, he/she lets it stand overnight. Once it is well rested, the tourier (which is the baker who takes over the next steps) passes the dough through the rolling mill, it is a machine that spreads the dough and thins it to the desired thickness. The tourier then inserts some butter and makes several rounds, that is to say several foldings in order to get the croissant's puffy pastry. Then he/she puts them in the fridge to cool for a few hours. Afterwards the tourier takes the dough and spreads it into the desired thickness. Finally, the dough is cut and rolled to create a croissant. mie Kouign is in the cooking! ball of dough. For the final step, the pastry baker adds the mixture to the well-greased molds. ded once again to bring you behind the scenes and share two of her recipes: the fabulous blue cheese and walnut ficelle as well as her eparation and the step by step process to a delicious homemade product you will enjoy every day. desired size. Then he/she lets it rise for about an hour. is after this stage that the baker adds the rest of the ingredients which are mainly the yeast and salt. Then the baker adds the nuts to the dough and lets it rest for 24 hours. C Red peppers contain more vitamin C than oranges Carpophobia is the fear of fruits. In India, one out of two people never tasted chocolate. On average 14 359 baguettes come out of Mamie’s ovens every year. The paris-brest pastry was created to celebrate the bike race Paris-Brest-Paris and represents a bicycle wheel. The Corn Flakes were originally stale oat flakes, to avoid throwing them away they were flattened and grilled The American Ruth Wakefield who created the cookies gave the recipe to Nestlé in exchange for chocolate for life. Mamie Clafoutis sells an average of 37 514 croissants per year. The little + Mamie's special breads require 72 hours of work and rest! Why so much time? Mamie prefers to allow her dough to ferment naturally rather than add chemicals products. And yes! Natural fermentation (action of flour enzymes with the presence of water) takes time, it degrades all chains of gluten in the bread if you want a product easy to digest. It also assimilates minerals and improves the nutritional value of bread. And it's Mamie's priority to offer this to her clients! The seasonal fruits Mamie shares some tips on four summer fruits in Canada! You will find all kinds of useful information to know how and when to consume them locally during their harvesting time. A Greek legend says that the raspberry, very popular with the gods of Olympus, originated on the slopes of Mount Ida, in Crete, hence it was named: Rubus idaes, meaning: "The Thorn of the Ida". The raspberry you usually consume is red, but you can find it in black, yellow, orange, amber or white color. Peaches are a source of antioxidants, vitamin C and E, iron and copper, but also fiber. The carotenoids contained in the peach give a tan complexion to its consumers and promotes natural tanning. Juicy and tasty, the peach will effectively quench your thirst during the hot summer days and will not make you gain a gram since it is composed of 90% of water! Raspberry has immense antioxidant power, but it is also a very good source of vitamin C: 100 g of raspberries provides more than 20% of the recommended daily intake for an adult. Raspberries are also an excellent source of fiber. The small "grains" in the raspberries contain cellulose, which helps the functioning of the intestines. Salty: in your salads, surrounded by a slice of raw ham, with your white meats or seafood. Salty: with a salmon carpaccio or duck breast, in salads, sauce or coulis. Sweet: flamed, in sorbet, smoothie, or coulis. Goes well with ginger. Sweet: in pies, charlottes, clafoutis, crumble, sorbet or ice cream. The blueberry is part of the large cranberry family, which also includes wild blueberries and cranberries. There are about thirty blueberry varieties in North America which grow on shrubs less than 1 foot high and some plants reach up to 15 feet high! The Strawberry, Fragaria vesca in Latin, means, its "fragrance". The strawberry has always existed, it is in the middle ages that we started to cultivate them by introducing them into the garden. Today, there are more than a dozen varieties in Quebec! Mamie's tip: the very green aspect of her peduncle is a hint of freshness. Blueberry is considered a superfood, especially because it contains a lot of antioxidants helping to fight cardiovascular diseases and diabetes. The blueberry also contains a lot of vitamin C, K, iron and manganese. It is also low in saturated fat, sodium and cholesterol. Sweet to perfection, the strawberry is rich in minerals, vitamin C, as well as antioxidants, which is especially beneficial if you taste them raw. Composed of 90% water, it is one of the least caloric fruits! Salty: with pork, chicken and game meat, spices, in salsas and other fruit sauces enhanced with chili. Salty: with all your fresh dishes, like a beef tartar, salmon or in your salads. Sweet: in cakes, puddings, muffins, pancakes... with dairy products. Sweet: in pies, ice creams, charlottes, mousses... To be mixed with fresh herbs such as mint or basil. The blueberry In Canada, the peak season goes from mid-July to the end of August and you will find them mainly in the Lac SaintJean area. In Quebec, they can be enjoyed from the beginning of June until the first frost in October. Found in the regions of Montreal, Trois Rivières, Saguenay and Quebec City. You will find the best Ontario peaches during peak season, from July to September. Throughout the summer, Mamie makes her delicious homemade pies using fresh local seasonal fruits. You can find them during peak season which goes from July to September. Mainly in the regions of Montreal, Trois Rivières, Saguenay and Quebec city. Bring cash, many producers do not take debit or credit cards! A few days before, contact the facilities to ensure that they are open and that the fruits are ready to be picked. Not all facilities allow you to use your personal containers for picking. However, once paid, nothing prevents you from transferring your pick into your containers. Allowing their baskets to be reused by someone else. The fields are in full sun, think about wearing a hat, drinking lots of water and putting sunscreen! Shadbush berry Did you know that there are several less well known berries that grow in Canada? The shadbush berry is a small sweet fruit that looks like a blueberry. Sea buckthorn is a small, orange-colored oval berry with an acidic taste that compares to a mixture of tropical fruits. The camerise berry, looks very much like a blueberry, but with a cylindrical shape and has a sweet and sour taste. The chicoutai is a small orange fruit, which looks like the raspberry with larger alveoli. Summer is the season when these delicious little fruits show the tip of their noses. Strawberries, raspberries, blackberries, blueberries... What a feast!! Empty the egg, it will have to be filled with the brownie preparation. Place them in a muffin pan. Use a bit of aluminum foil to wedge them properly. If you want to make a simpler brownie recipe, Mamie has a brownie mix in a jar, which you can purchase and bake at home, available in all of our boutiques. Happy Easter! Mamie's creative workshop Enjoy the return of the sun and the warmth while gardening and decorating flower pots. Watermelons, plants, flowers, let your imagination go. This is a great way to personalize your garden this summer. With duct tape, cover 5 cm on the bottom of the pot, make sure it is straight and well glued. This portion will be the green skin of your watermelon! Paint the jar in red with the spray paint and let it dry. When your pot is dry, gently peel off the tape and paint this part in green. Be careful not to paint the red part. If this seems difficult, ask an adult to add tape on the red part that defines the future green part! Step 3 With a black marker, draw the small seeds of the watermelon on the red section of your pot. Step 4 Your pot is ready, let it dry well and plant some pretty flowers! In a bowl, mix the flour and the eggs. Dilute the dough by adding the milk gradually by mixing it with a whip. Mix the buckwheat flour and baking soda. In another bowl, mix the milk, the egg and the salt. Add the liquid mixture to the flour in small quantities, avoiding too much mixing. Add water and correct as needed to get a nice smooth texture. Pour the crêpe batter into an oiled skillet on high, small holes must form. Turn them over once they are golden brown. Add the melted butter. Cook thick crêpes in a hot, buttered skillet. Coat the crêpes with the Mamie chocolate spread (it will melt in contact with the hot crêpe) before stacking the following crêpe. Serve hot! Mix the ricotta and cream cheese with freshly chopped dill and pepper. Cut twelve discs with a round cutter. Cut thin slices of cucumber. Prepare the millefeuille by spreading a layer of fresh cheese on the first disc, add a piece of smoked salmon and some thin slices of cucumber, spread a little cheese on both sides of the second disc of the crêpe, then add another layer of salmon and cucumber. Finish with the last crêpe disc by spreading a little cheese on the inside. In a bowl, mix the flour, salt and eggs with a whip. Add milk as you go while mixing vigorously. Add the oil and mix it to get a homogeneous dough. Add water progressively. Separate the white from the egg yolk. In a bowl, mix the flour, vanilla and sugar, dig a well and pour in the milk and egg yolk, mix with the whip. Mount the white until it is firm and gently incorporate it into the preparation. Finally chop the chives, parsley and garlic and add them to the dough. Mix altogether, cover and let stand for 2 hours in the fridge. In a hot, oiled skillet, cook your crêpes and place them aside. Once they have cooled down garnish each crêpe with: 1 tbsp of cream cheese, a few pieces of salad, 1 slice of cheese, 1 slice of ham and a sprinkle of salt and pepper. Roll them very tightly and cut into pieces, serve and enjoy! Cut, peel, remove the seeds and slice the apple. Add them in the dough and mix to coat them. In a warm skillet with oil, pour the preparation, cover and cook on low for 7 to 10 minutes on each side, the pancake must be golden. To easily return the pancake without damaging it, turn it over using a plate and then place it back into the pan to cook the other side. Serve hot with the salted caramel from Mamie Clafoutis. The small relaxing page In this edition Mamie offers you a word search! Find in the grid the words listed below based on the vacation theme. Accompanied with a fresh lemonade and one of Mamie’s pastry’s, enjoy and relax. The next appointment with Mamie is in September for the Autumn products! mamieclafoutis.com French version on the websiteâ&#x20AC;&#x2030;!